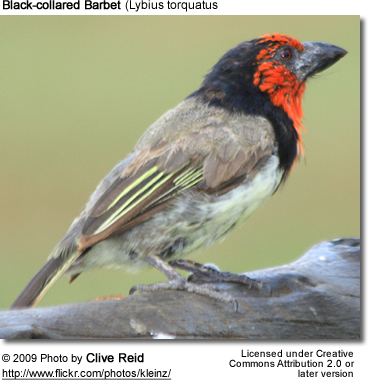 The Black-collared Barbet (Lybius torquatus) is an African Barbet that is found in sub-Saharan Africa through Angola, Botswana, Burundi, Democratic Republic of the Congo, Kenya, Lesotho, Malawi, Mozambique, Namibia, Rwanda, South Africa, Swaziland, Tanzania, Uganda, Zambia and Zimbabwe. 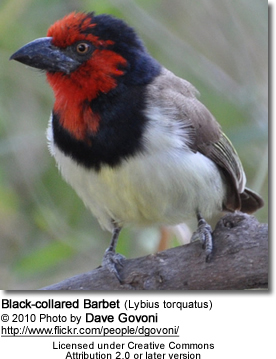 This bird is easily recognized by its loud duet, commonly rendered as "too-puddly too-puddly too-puddly".... and its snarling warning call. 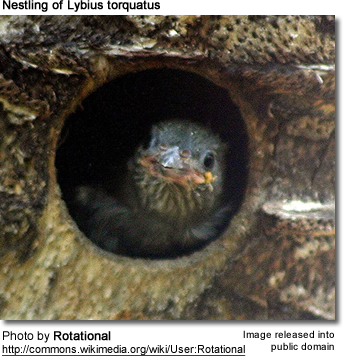 This species often acts in concert when driving off intruders and roosting together in nest holes. 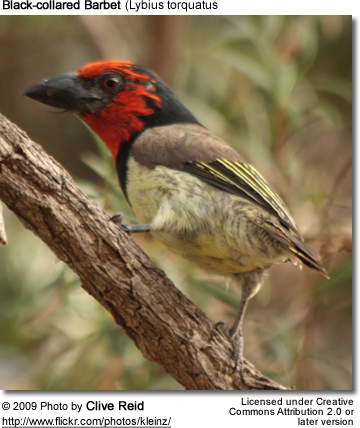 These mostly solitary birds eat a variety of fruits. They will also visit plantations and take cultivated fruit and vegetables. Fruit is eaten whole and indigestible material such as seed pits regurgitated later. They will also feed on insects, such as ants, cicadas, dragonflies, crickets, locusts, beetles, moths, mantids - sometimes even scorpions and centipedes. They may also eat lizards, frogs and geckos. 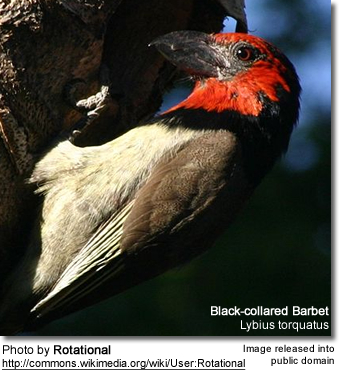 They usually nest in holes bored into dead trees, branches or stumps - occasionally in riverbanks or termite nests. The hen usually lays between 2 to 4 eggs that are incubated for 13–15 days. Nesting duties are shared by both parents.